It’s been 30 years since I graduated high school, so you can guess what’s come up. I’m not sure I’ll go to the reunion. It involves a total of ten hours travel time, and I’m not sure the math adds up. At first, I gave absolutely no thought to going. What did any of that have to do with my life right now? But, a couple of nights ago, for some random reason, I decided to accept the friend request from the facebook page for Centennial’s high school reunion. I found myself fascinated, spending a significant amount of my severely limited free time to cruise the profiles of everyone associated with the page. Many people look back on that time with fond memories. Me, not so much. I cringed a little when someone gushingly posted our old class motto, “We’re the best that we can be cuz we’re the class of 83!” I hated that motto the entire four years of my education there. Isn’t there always room for improvement? Was my miserable teenage self really the best that she could be?? Were any of those cretins I went to school with the best that they could be? I started to think about our mascot, Elmer the Eagle. Of all the images to remember him by, one overshadowed all the others. But I had to spend quite an inordinate amount of time scouring yearbooks to come up with the picture above. I thought it would be plastered all over the year book, it was so prevalent in my mind. Instead, I had to come to grips with the truth that I had only glimpsed a student made poster from a homecoming float my freshman year. Wow. Just wow. This random image seems to be the emblem of my emotions of my entire high school experience. Since I had to look at it closely in order to make sure you would see the details of the image, I found it to be rather quaint. Look, they were very careful to use red and blue, our school colors. I feel very apologetic to the innocent student earnestly composing this poster. “Happy Birthday Elmer” How sweet. Of course, looking at the pictures of us young students, I found each and every one of them, even the nerds, to be luminously beautiful. Yes, some students I still identified as nerds, but please remember, I thought of myself as a nerd, too. And my older self realizes we weren’t nerds, we just didn’t have the social capacity for rising above the low opinions we and others had about us. For myself, I was never the most well adjusted teenager. I was struggling with an emerging mood disorder and tragically low self esteem. I had been bullied my first years of moving to Oregon. Not a patch to what today’s kids endure, but it traumatized my sensitive ego. And by the time I got to high school, I was thinking about suicide. No one knows, but I made one very pathetic and ineffectual attempt. Honestly, I think I was entranced by the romance of mental illness. What a thing to idolize. Other kids were busy making friends, and homecoming floats. They were playing on sports teams, or attending them. They were pursuing their wholesome interests, one way or another. I guess I was pursuing my interests too, the melancholy girl interested in mental health. It should come as no surprise that I’ve battled a mood disorder my whole life, then. One of the tools to combat depression is affirmations. Affirmations have worked literal wonders with me. But I had to get over a large hurdle first. I had to realize that what you tell yourself doesn’t need to be true, it just needs to be what you want to be true. Like telling yourself that you are the best that you can be! Affirmations should always be framed in the present and positively, just like the name of my blog isn’t. I’ve heard it put forth that the brain does not register not, so when I say I’m not a complete idiot, what I’m really hearing would be…….Can’t be more diametrically opposed to positivity than that. I’ve had to come to grips today with the fact that I have looked at my education with a highly distorting, negative filter. 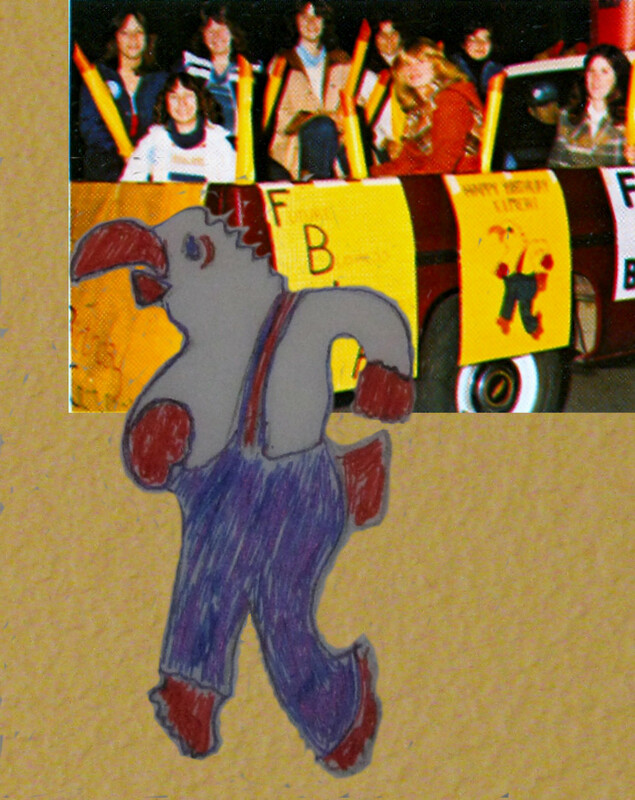 Some random, ingenuous image on a homecoming float symbolizing all that was wrong with high school? Looking at kids with the same impressions I had back then, I wonder what my experience could have been like if I had been open, warm hearted, and just cheerful. I decided I was ugly and unlikable because of some hurtful things that happened to me in the fourth, fifth and sixth grade and I let it color my entire life until recently. That says kids shouldn’t bully one another, but it also says that I wasn’t given the tools to get over that. I’m not a parent. If I was, maybe I wouldn’t say that we shouldn’t try to insulate kids from unpleasant situations. Not only is it impossible, it teaches you and molds you into the person you will become. Hopefully kids today just learn how to let those unkind words and actions roll off them. It should teach them how to stand up for themselves, to exact fairness from others. And it should teach them how they should not act to others. I smugly thought I was immune to such behaviors, but I can recall being a jerk a few times. At the very least, I was very judgmental to a lot of people, thinking they really didn’t like me and were out to get me. No one is immune to being a jerk, I guess, but it helps to learn how to be self aware, so you can try to be the best that you can be!